Clive Wilkinson’s design for GLG’s Austin branch has all the trimmings of a modern workplace: an open office encouraging collaboration, work stations for varied tasks, and communal spaces to keep moral high. What makes this office space truly innovative though, is it’s emphasis on ABW or “activity based work”. In an article about GLG’s office, Dezeen explains, "The ABW method of working empowers users by supporting a variety of working styles. By relinquishing corner offices and cubicles, the working environment gains efficiency and allows for additional communal spaces such as the barista bar and plaza. 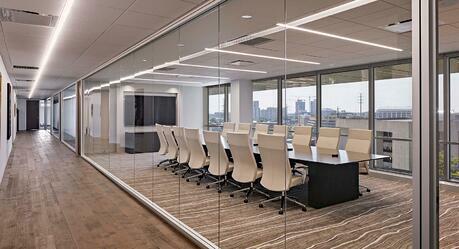 The ABW concept is intended to facilitate collaboration and creativity, as well as provide comfort for employees. " Inside the office there are four distinct work areas. Each houses a different business group and is outfitted with the tools needed to support that particular type of work. Workers move freely between these stations throughout the day. By working with varied groups in different environments, workers find inspiration through an ever changing roster of partners, tasks, and work strategies. 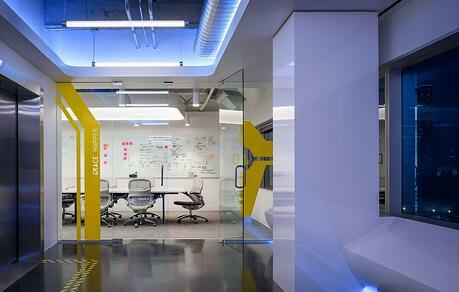 Set one foot in Mortgage Choice’s office designed by B.E. Architecture and you’ll instantly be transported back in time to the relaxed lounges of the 1950’s. 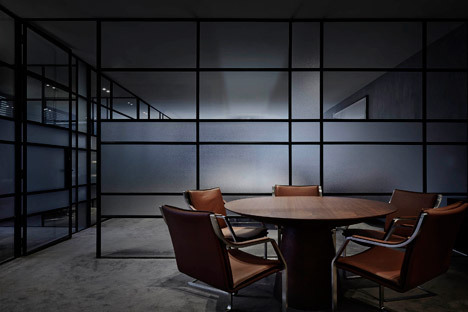 Using translucent glass, grey walls, focused lighting, art deco furniture, and sparse furnishings to evoke the floor plan of a studio, B.E.’s design and color pallet create a particularly refined atmosphere that speaks volume to the professionalism of the company. 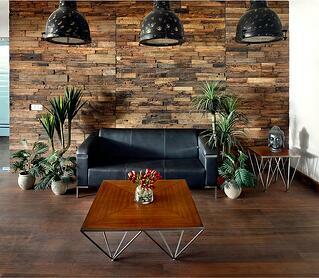 The innovation in this design comes from the deft selection and arrangement of features in the office. B.E. explains, "The finishes and furnishings are an eclectic mix that is less about luxury and more about creating a memorable space." B.E. furthers that each piece of furniture and art was selected because it modeled the homey atmosphere of 1950’s dens. The darker color pallet and dim lighting emphasizes the unifying color themes that tie the space together. 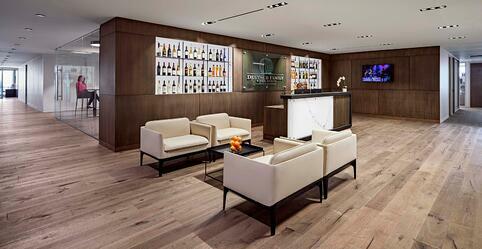 Similar to the lounges this office was modeled after, clients and employees will feel more at ease here. Companies regularly build philosophy into office design to motivate their workforce and build a sense of communal identity. AVG took this concept to new heights with Gulf Ispat’s office located in India. 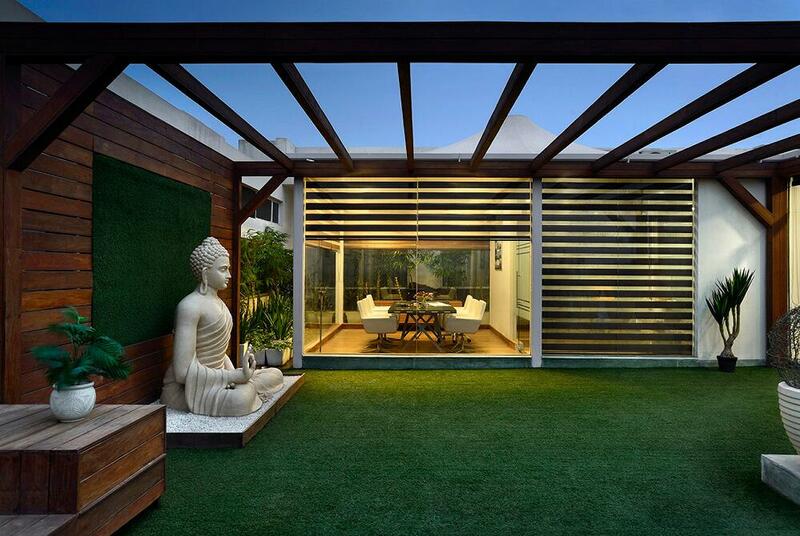 Every part of this office seeks to channel buddhist beliefs of peace, zen, and connectivity to the natural world. The building is made entirely of natural wood and stone. The outside plaza is covered in grass. And to connect it all, most walls include large bay windows that bring these natural elements right into the room. 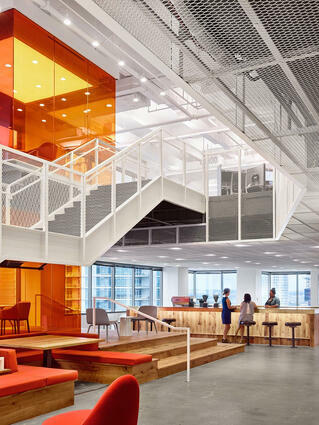 Many companies bring visual expressions of their brand into the office space. Few though, build both their brand and their product into the actual architecture. Deustch Family Wine & Spirits commissioned Amenta Emma to do just that. In the creation of these work spaces, designers also injected brand elements: lighting fixtures that look like grapevines, door frames designed as wine barrels, and display cases to show off their wine selection. For a company in such a dynamic office space, these brand elements bring the company together, and make a consistent experience for all who enter. 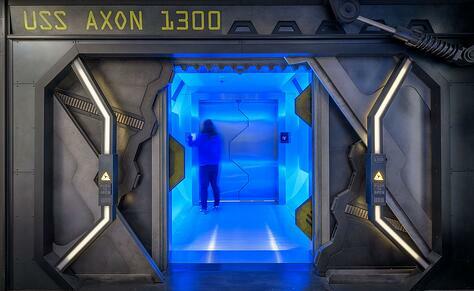 Weaver Architects created a truly inspired space for Axon office, a tech company based in Seattle. Axon wanted to make an office that reflect their company's guiding statement, “a porthole into the future of technology”. That tall, imaginative claim was reflected in a very unique way. Axon’s office really speaks for itself, standing as a testament to what is truly possible with a little creativity, ambition, and vision. These designs may be a little extravagant, but their innovative steps inspire and provoke a discussion about the right point on the continuum between subte and extreme. Each company is unique, and has something new to bring to the table. Bring yours, and then make it a centerpiece. When clients come around, it'll be the first thing they notice.